Discover myriad other uses here – Hot Flash Pillow. Comments Off on Discover myriad other uses here – Hot Flash Pillow. 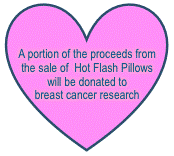 Comments Off on Hot Flash Pillow Giveaway! Read Nancy’s featured guest blog, “Empowering Ourselves Through Menopause”, on the Real Women on Health website!